There's something to be said about local restaurants that are set so far in the middle of NO WHERE... they are typically a gem that you'll be happy you found. 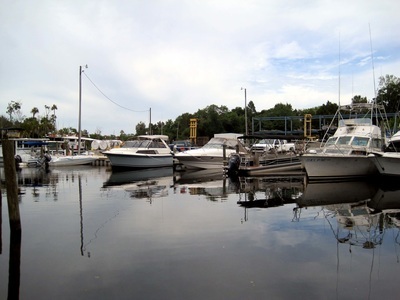 Courtnnie and I went up to Homosassa, FL for a road trip adventure which is always a blast. While we were traveling down some windy roads we fell upon a small building that had a ton of people parked across the street. 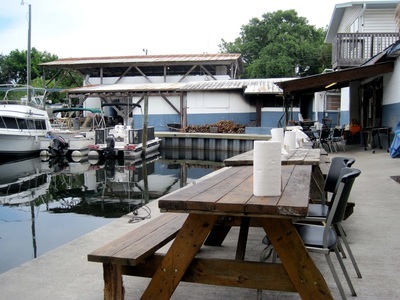 It looked like it was a bait shop or just a small marina, but when we saw families walking inside without fishing poles we knew it had to be something else. 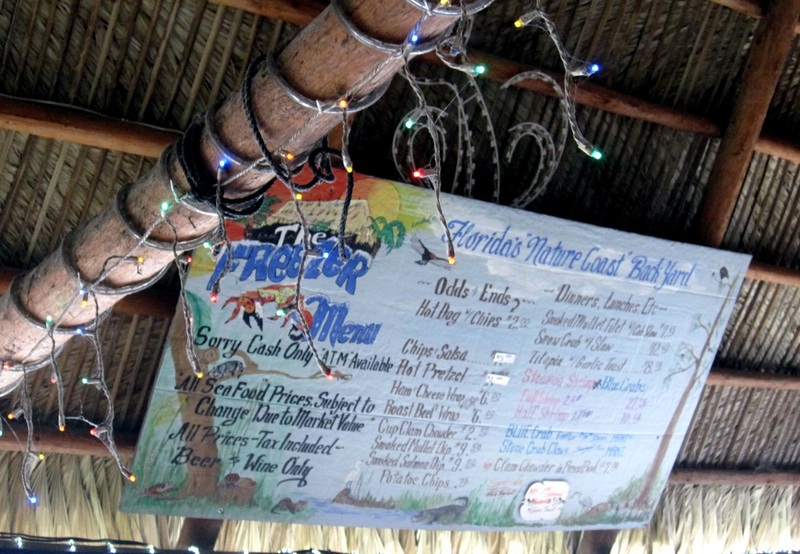 The Freezer Tiki Bar may not look like much from the outside, but follow the hoards of people that are gathering to get some grub and you'll be pleasantly surprised. When we started to walk up we were a little nervous that we were going into the back door of some weird marina or something, but once we got through the plastic door strips we saw that this place has character. The Freezer Tiki Bar was filled to the brim. Everyone was hustling and bustling around with a ton of smiley faces. People at the bar were already saying hello as we walked by, families were sitting with their children at the fold out tables and chairs and retirees were sitting at the high tops drinking buckets of beer. Courtnnie and I found a great picnic table that over looked the boats and water. We had to set our stuff down to save the table before we went back inside to stand in line to order. The ordering process is really the only thing that I didn't care for about this place, but honestly it does make it a little more unique. You have to stand in line in the middle of the restaurant and the menu is on the ceiling. 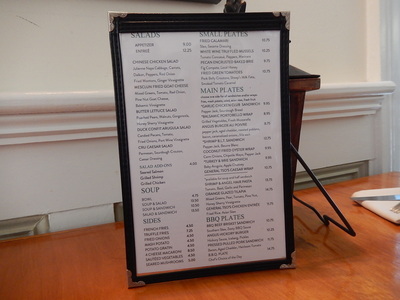 The menu is small and only consists of about 20-25 items. They have items such as hot pretzels, clam chowder, steamed shrimp, crab claws, mullet, tilapia and more. From what I could tell there was no fried seafood on the menu. You also need to know that The Freezer Tiki Bar is CASH ONLY. Luckily we came from yard saling so we had cash on hand. They gave us our clam chowder and drinks right away which was nice because the wait time for our meal was about 10 minutes longer than you'd expect. It got to the point where we were wondering if we should go back in to check on our food. The atmosphere and the people keep you busy for most of the wait, but it still seemed like a long time. Once our food was ready they do bring it out to your table. It comes in a take-out box which makes it easy if you're looking to get going right away. 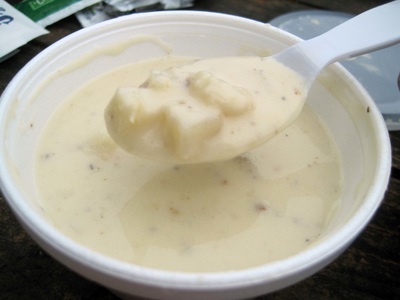 The chowder tasted great! There was plenty of clams in it and the potatoes and seasoning was the perfect mixture. 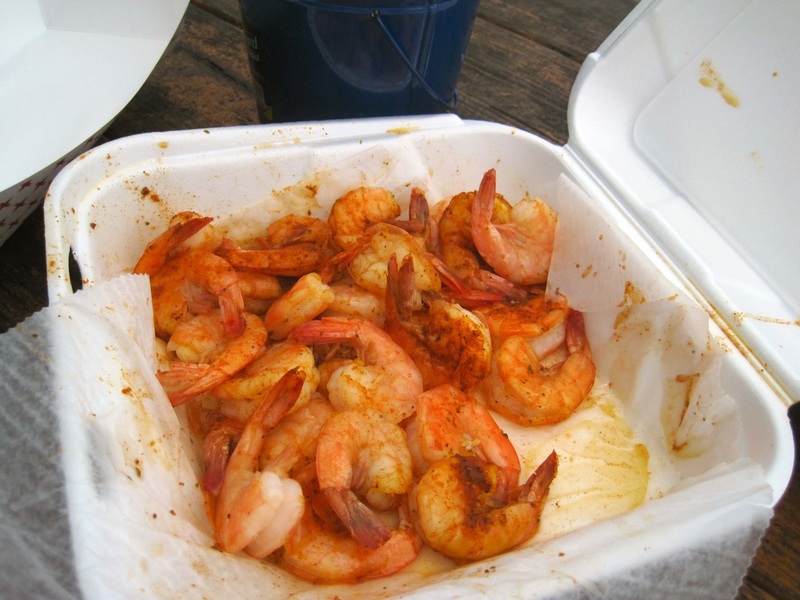 When our half order of steamed shrimp came we were please to see that it was plenty to split between two people. Maybe even three people if you come with a light appetite. The shrimp had a light cajun seasoning and cocktail sauce and butter garlic sauce on the side to dip. It worked out perfectly for Courtnnie and I because I liked the cocktail sauce and she was enjoying the butter garlic sauce. Both were tasty. 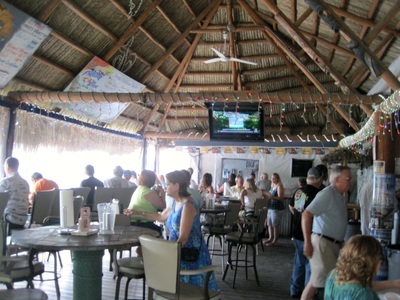 When Courtnnie and I left The Freezer Tiki Bar we expected the lunch rush to be gone. Well it wasn't. The rush had gotten even bigger and we couldn't believe how many people came from all over this town to eat at this little seafood place. If you're looking for 5 star service and a quiet conversation between you and your friends, this isn't the place. 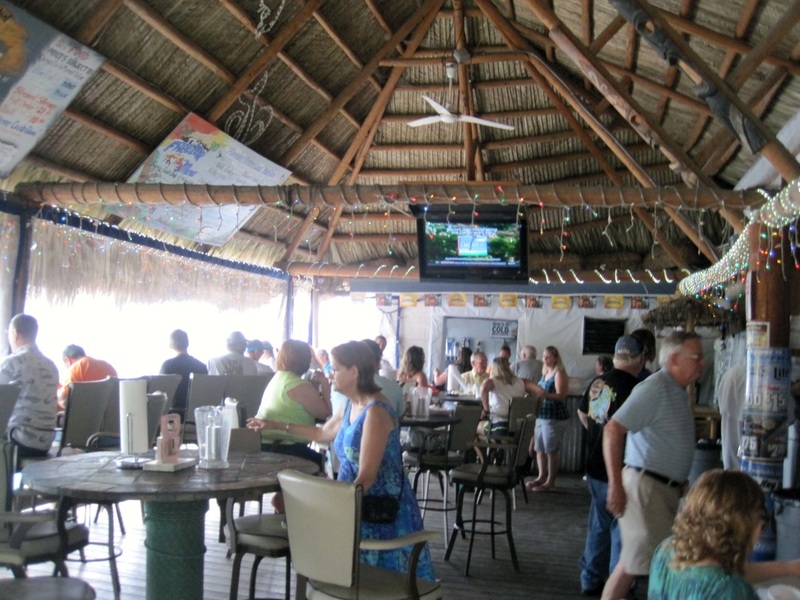 If you're looking for a low key, chill by the water, drive up in your boat, bring your dog and kid and neighbor and family type atmosphere then The Freezer Tiki Bar is where it's at. This place is ridiculous! Ridiculously good! I've been going here for a few months now and I always forget to write a review about it. Or maybe I just didn't want to secret to leak out about how incredible it is. Just like most sushi places this location is in a shopping center next to a gym and a furniture store. In my opinion the only thing missing is a Twistee Treat location. You could start with the gym, eat some sushi and head out to the furniture store to spread out after eating your heart out. I mean seriously, this stuff will put you in a food coma. Okay let's take an inside look. When you walk in it's pretty dark inside. 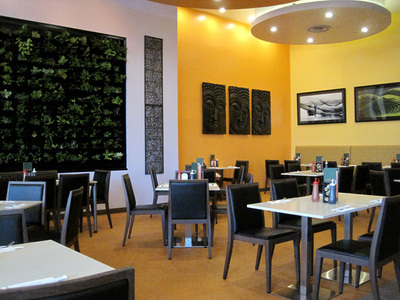 The decor is mainly black with hints of lighting to at least get you to your table. There is a large fish tank that the kiddos seem to enjoy. The tables have a tablecloth, but then it's covered with brown paper (because of the high turnaround I'm sure). Although I believe that Sushi Alive isn't the most romantic of places inside it does have its charm and to die for sushi. That's romantic enough, right? The wait time for Sushi Alive during the weekdays tends to be pretty lengthy. I suggest calling ahead if you have a larger group. The service is always pleasant, but not overly talkative. They come to your table and take your order and make sure you always have fresh drinks. We have our favorites of course, but even they don't say much when they come to our table. For starters I always order the ginger salad. It's medium size and always fresh and they add the best dressing I've ever had. The ginger dressing that they add is very chunky and has a peppery undertone that lingers after the spicy ginger. I could probably just go in and order this on occasion and I'd feel full after two of them. I've only had the miso soup once and it was tasty, but nothing to brag about. Just normal miso soup. Whenever I go to Sushi Alive I seem to go in large groups. 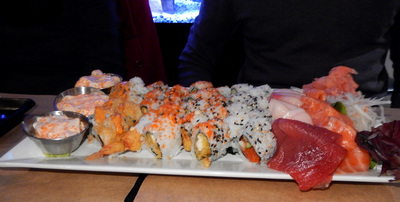 We end up ordering enough sushi to feed an army because of the specials that they have Monday through Friday from 5pm - 7pm. They have about 6 or 7 different sushi rolls that are only $3.00 for 8 pieces and they have half price house wines. It's great! 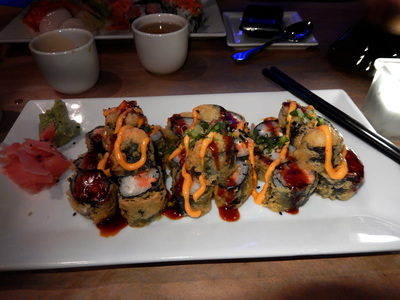 The sushi always comes fresh and with plenty of ginger, wasabi and even spicy mayo. 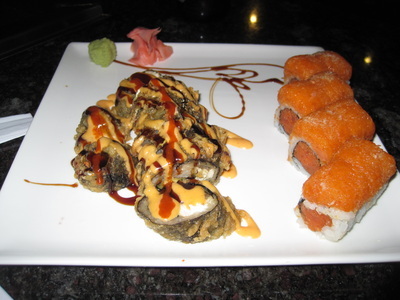 The tempura style sushi is one of my favorites because it has a great crunch and it's never soggy. 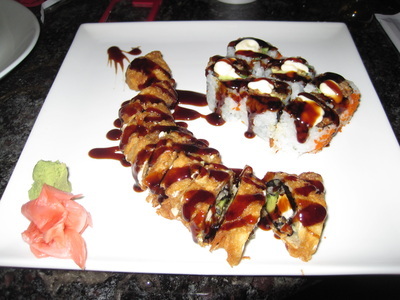 There's nothing worse than soggy tempura sushi. My friends are a little more daring and they get some pretty cool dishes that always seem to be presented so well. There's really not much left for me to say about this place without sounded like they hired me to do this review for them. Which they didn't! 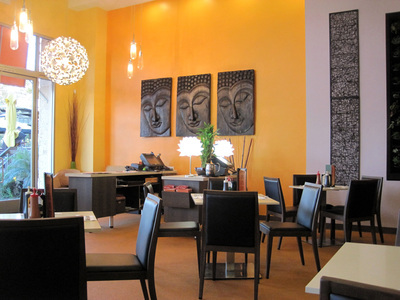 I just absolutely love their sushi and even the dark atmosphere. It was a hard decision, but we finally decided to land on Circa 1886 for our New Year's Eve dinner. They had a six course meal already laid out and it sounded amazing. None of us had ever been here before and we didn't know what to expect. The reservations were for 7:45pm and we made sure to arrive a few minutes early. The restaurant was in a gated area with a courtyard and brick pathway lined with trees and street lamps. Being that it's still winter/holiday season there were some white lights wrapped around some of the trees outside. There was street parking available just outside of the courtyard area. It was actually really nice walking through the courtyard to get to Circa 1886. It was like an adventure before getting to the main event. When we walked into the restaurant we were stepping into an old world bar area to the left and the dining area to the right. They had our table ready as soon as we walked in. The room had booth seating that gave the appearance of being very romantic and private because it was framed in almost like an entryway. All the tables had white or silver table cloths with low lighting and candles in the middle with a single flower. Our servers were dressed in black and white and all were very sharp looking. We had one main server and the others helped bring out all of the plates so we would be served at the same exact time. 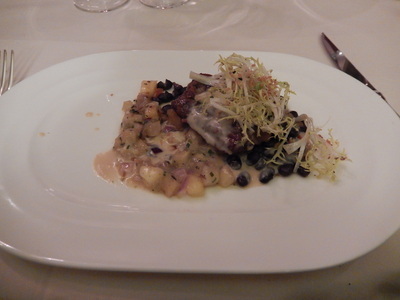 The main server was extremely knowledgeable about the wine list and pairings. Being that we were at Circa 1886 for New Year's Eve we didn't have a choice of the menu. All of the plates were preset and we were just there to enjoy the ride, and oh what a ride it was. The menu was inspired by different countries all starting with the one that would have New Years first based on the time zone. 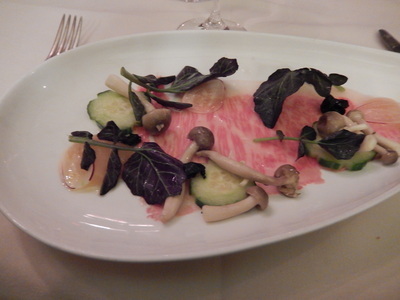 I felt that each plate was well thought out and nothing was too standard. For instance, Greece was on the list and yet the plate was anything buy ordinary Greece type food. 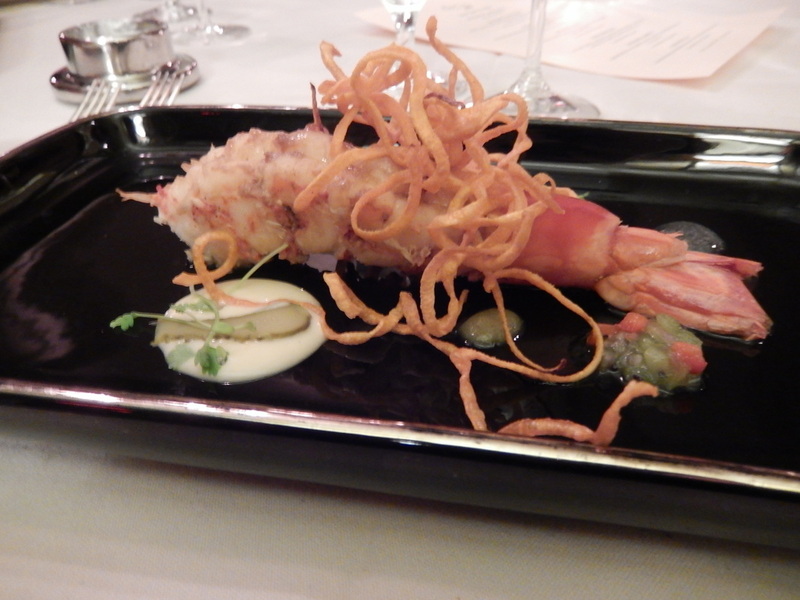 Each plate had a twist that was absolutely outstanding. 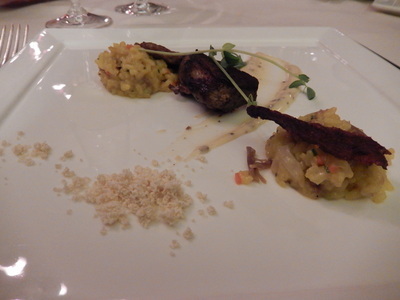 The presentation of the plates were remarkable pieces of art and the flavors were clean and unique to the countries. There were a couple of plates that I didn't like, but I don't feel like it was because of the execution rather my taste in food and textures. For instance I really didn't enjoy the Banana Coconut Soup (Amuse Bouche) or the Kobe Beef Salad (raw Kobe), but it was because of the texture and taste not because of the quality or lack of flavor. I did however love the plate from Greece, Spain and the Caribbean. All of those dishes were incredibly true to their culture and were flavored perfectly. I can honestly say that the Duck “Paella” (from Spain) was the most incredible thing I've ever tasted in my life. I will probably seek out duck on every menu from this point forward in hopes to find something as amazing as this dish. At the end of the meal Circa 1886 topped us off with not one, not two, but three different types of desserts for us to try all inspired by the U.S.A. The plate had a slice of cornbread pudding, homemade snickers bar and peach ice cream topped with white chocolate. The cornbread pudding was a little too heavy for me after such a large feast. 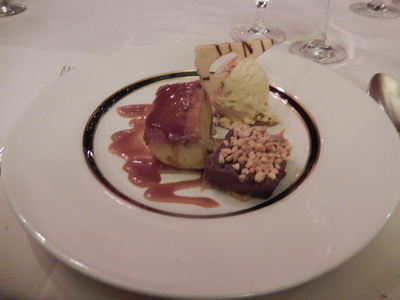 The peach ice cream was a perfect choice for those that wanted something light and not too sweet. But at our table the homemade snickers bar was the big hit. It was deliciously creamy with the right amount of nuts and chocolate with a drizzle of caramel and homemade peanut butter. It made me glad to be an American! I can tell you that the next time I'm in Charleston, SC I will definitely be adding Circa 1886 on my list of places to eat again. While I would love to try some of their regular menu items, I'm going to be honest and say that I'd be going back in hopes to have some of the worlds best duck again. If it wasn't on the menu I'm sure I could find another amazing specialty that the chef has to offer. Circa 1886 was everything and more than we could have hoped for in saying goodbye to 2014. This little gem has made it to my "Best Served" list. While I didn't know what to expect because my friend's planned the food arrangements for this trip, I was pleasantly surprised by this quaint restaurant. 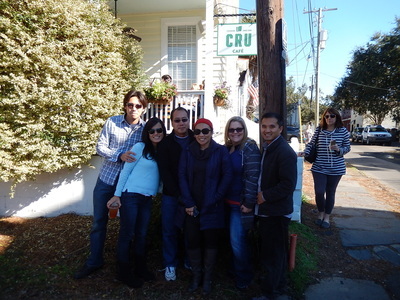 The Cru Cafe sits on the corner of Montley Ln and Pinckney Street in Charleston, SC. When you walk up to the restaurant you get the sweet smell of a wood burning stove as you walk up the steps of a beautiful porch decorated with rod iron tables and chairs. As I we walked into the Cru Cafe I noticed that the place was empty with only a couple of tables in the front room and a few more in a room to the side. It was decorated like an old home except for the open window area where you can watch the cooks. While I realize that a party of six could be a large party for most restaurants I was surprised that we needed reservations for the Cru Cafe being that it was empty when we got there at 11:45am. It wasn't until around 12:30pm that I realized just how busy this place can get. They were turning people down at the door because of how full they had gotten. If you didn't have a reservation you weren't getting in. 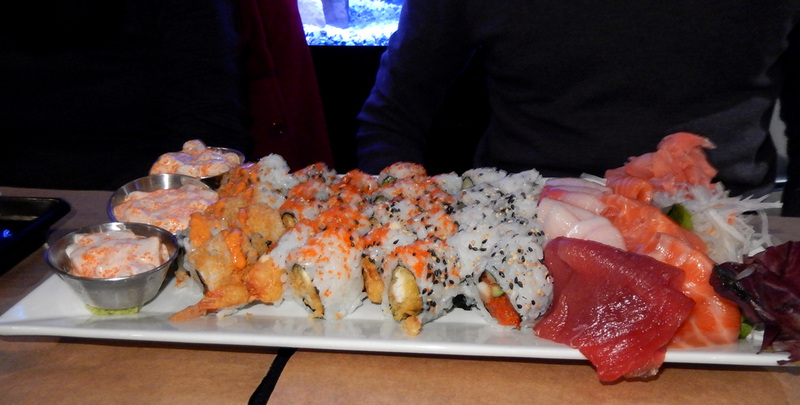 As a group of six we decided to order a couple of appetizers to share. 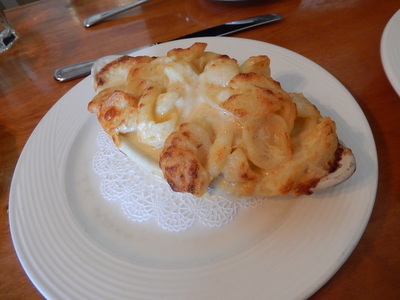 We were told by the waitress that their signature dish was the 4 cheese macaroni so we made sure to try it. 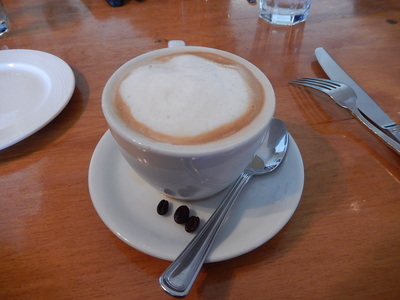 We also ordered the calamari and White Wine Truffled Mussels along with some cappuccinos for the table. When I got my cappuccino I could have swore that I tasted a hint of orange zest, but when I asked the manager he chuckled a bit and said no. We joked a little about it throughout the rest of the meal. I like a restaurant that can partake in our ridiculous humor. 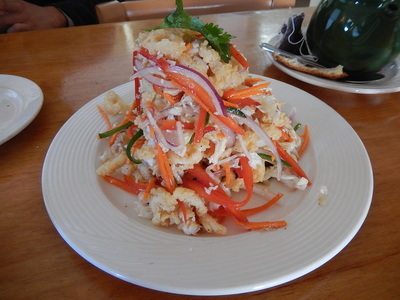 When we received the calamari it was tall and decorated with thinly sliced carrots, red onions and green peppers. The smell of sweet sesame sauce not only made the calamari smell wonderful, but the taste was light and tangy. This was probably the best calamari that I've had in ages. The signature 4 cheese macaroni was a big hit at the table for everyone except me. I liked that the top was browned and crunchy, but it lacked a little in flavor for me. Maybe it needed more salt or a pinch of mustard powder, but either way my momma's recipe is more inviting. The mussels were the biggest hit for everyone at the table. 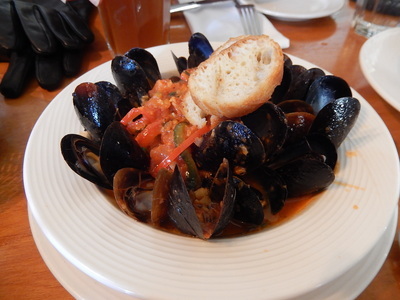 The mussels were smothered in an amazing Tomato Concassé, Peppers, Marinara sauce that was almost drinkable. Actually to be fair I think one of us did end up drinking a couple spoons full while the others doused their bread in it. 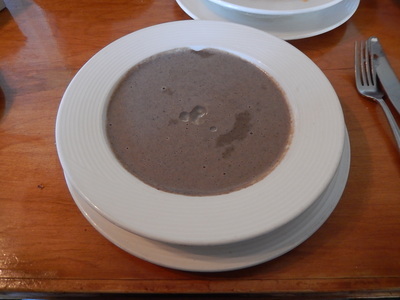 I wanted to make sure that I ordered something from their specials for the day and it was easy for me to decide on the mushroom truffle soup. I also ordered the signature dish Smoked Turkey and Brie Sandwich with a side of Asian slaw. 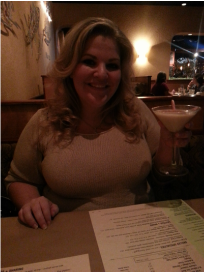 As we were waiting on our meals we could actually smell the mushroom truffle oil as they were adding it to my soup. When it was brought out to the table I had to request 4 more spoons because the bowl was large enough to feed a small army. 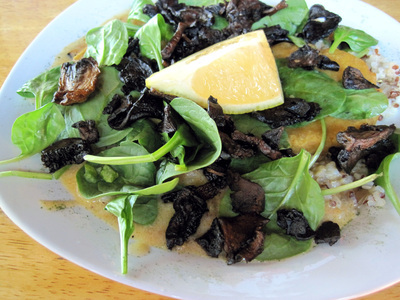 The texture was creamy with large enough pieces of mushrooms to have a bit of a bite to it. The taste was as luxurious as the smell and each bite had several layers of flavor. It was a blessing when my meal came because I was afraid that I'd get too full on the soup instead of the sandwich. The turkey and brie sandwich came with apple chutney and arugula layered between melted brie and thickly sliced turkey. The flavor of the apple chutney enhanced the flavor of the brie which made the whole sandwich taste a little bit better than a whole meal at thanksgiving. The slaw was fresh and had a hint of sesame flavoring which was tangy and sweet. 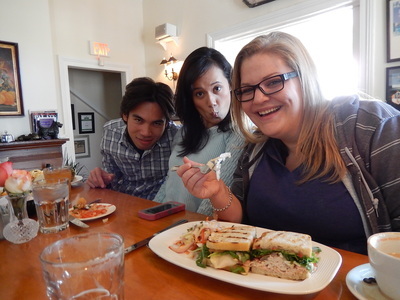 While I enjoyed my sandwich my friends enjoyed the Ahi tuna, B.B.Q. 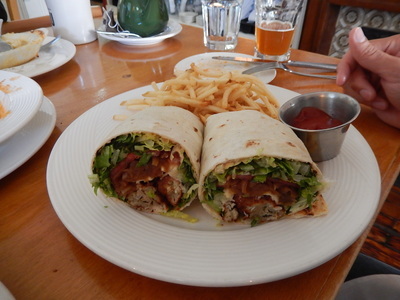 plate, Coconut Fried Oyster Wrap and a few other delightful menu items. At the end of the meal we decided to order the bread pudding as our dessert. It was great, but we had just had bread pudding the night before at Hall's Chophouse and the two were so incredibly different. 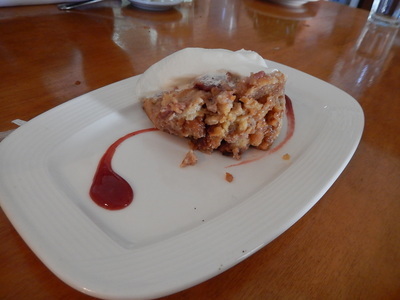 The Cru Cafe's bread pudding was more traditional with notes of cinnamon and caramel with freshly made whipped cream. The texture was soft and crunchy which gave it a lot of dimension. The thing I liked the most about Cru Cafe was the inviting atmosphere and the options that could suit just about everyone. We all decided that this was a place that we'd all like to try again maybe for dinner instead of lunch. There were so many great choices on the menu that we almost wished that we had more time to try other options. 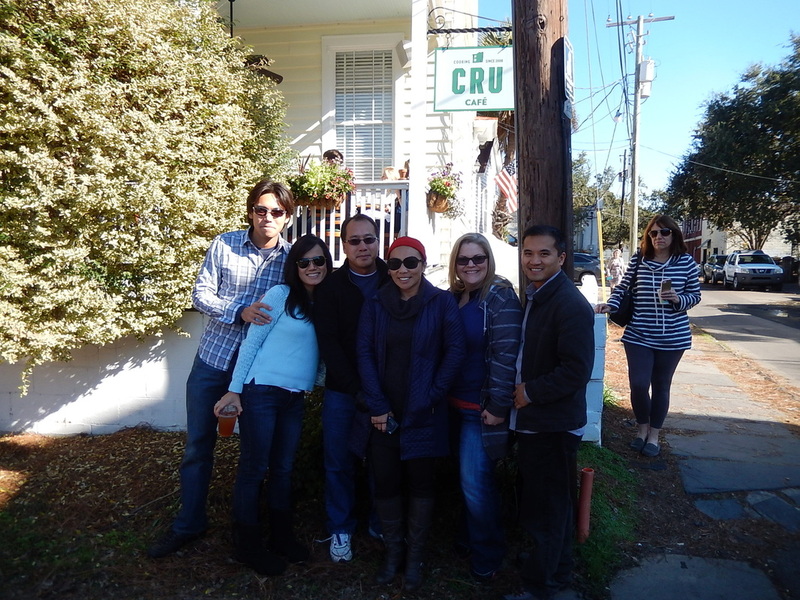 Cru Cafe is a must try in my book. What an amazing experience Hall's Chophouse was. From the moment we walked in this place was buzzing around with people enjoying cocktails and servers smiling and saying hello to everyone. Even Bill Hall stopped by to introduce himself to us (about 8 times actually). Hall's Chophouse had a warm classy jazz feeling to it with people of all ages hanging out at the bar and by the live band by the front door. We came in on a Tuesday night with a reservation for six. Hall's Chophouse was filled to the brim with people eating and drinking and enjoying the music. Standing room only from the moment we walked in. We only had to wait a few minutes before being seated upstairs in a small room which was packed full of people. The table was a half circle booth which made it very hard for all six people to cram into it and even harder to hear everyone. Although it wasn't ideal I will admit that there weren't any other options at the time. The only tables that could handle six or more people were already taken up by other guests. This room was very old world with beautiful pictures and low lighting. We could still hear a slight echo of tunes coming from the band downstairs. Once we were seated we were immediately given water and the wine list. 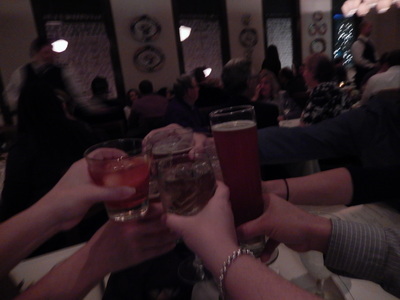 The six of us decided to order a few appetizers to share and reviewed the rest of the menu. The waitress knew the menu extremely well and her suggestion on the appetizers was perfect. She told us about their amazing crab cakes and oysters Rockefeller so we order a couple for the table. The crab cakes were filled with crab and flavor and could easily have been the best I've ever tasted. It was my first time trying oysters Rockefeller and I didn't know what to expect. The hollandaise sauce and spinach made the oysters Rockefeller very creamy and the bread crumbs added the perfect amount of crunch. Great choices to begin our meal. Not only does the menu offer a generous selection of beef it also has a lot of seafood options. My friend Vinh and I decided to share the 32oz Porter house with sauteed mushroom and onions on top. For the table we ordered a few sides that are served family style. We ordered the roasted brussel sprouts, broccolini and lobster macaroni. Each were delicious, but the lobster macaroni was out of this world. The brussel sprouts were a little over cooked, but otherwise the flavor was great. Seasoned with bacon and an aioli dressing with cranberries to add sweetness. When our steak came it was perfectly smothered in sauteed mushrooms and onions with enough for us to share and enjoy with each bite. The steak was buttery and almost melted in your mouth with a bit of saltiness from the edges of fat. It was incredible. I only wished that I had left room for more. For dessert we ended up ordering enough for the table of six to share. We ordered the whiskey bread pudding and the vanilla bean creme brulee. 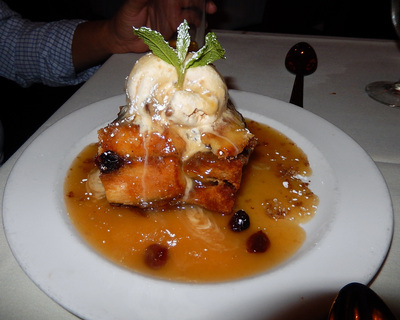 The bread pudding was doused in a very large helping of whiskey that was flavored throughout the sauce and within the layers of the bread. The dried cherries helped intensify the flavor of the whiskey and the pecans brought out the flavor of the cinnamon in the bread pudding. It was a huge serving and it could have easily fed all six of us at the table. 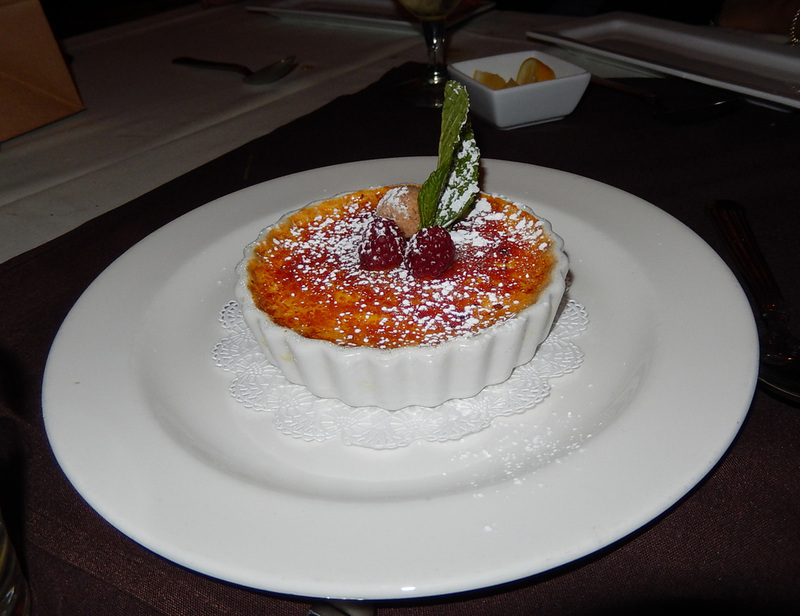 The Creme Brulee came was pretty typical and it was cooked to perfection. The sugar wasn't burnt and the flavor wasn't eggy. I will say that although it tasted like a creme brulee should taste it didn't have any distinctive flavors or aspects that spoke to me. I would probably stick to the Whiskey Bread Pudding or I'd try the chocolate layered cake next time. Overall the place and experience was one that I won't forget any time soon. This place would be perfect for an anniversary, date or birthday celebration. I never ran out of water and even though we weren't being pressured all the time for drinks, there was always someone there when you needed them. I have eaten here so many times I can't even count. 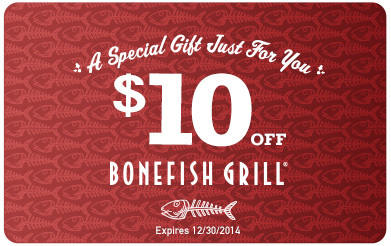 Every time I visit my parents we are always hopping in the car and driving up to The Loop to grab some Bonefish Grill. 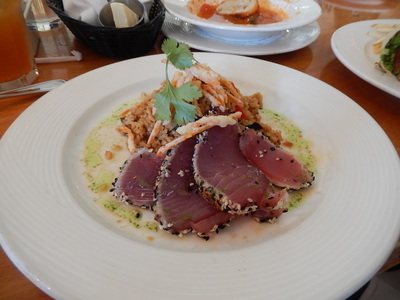 We love ﻿Bonefish Grill﻿ because we can't get enough of the fresh tuna sashimi. This is one of the better locations, because it has a ton of shopping available and plenty of parking. We're always treated so well here and I love that all the servers are dressed to impress. We have never had a bad experience here that they didn't fix right away. Once I had some sashimi that was a little too overcooked for my blood and they immediately got me a new order. You really can't beat that type of service when you go to a place all the time. My mom always gets the house salad, wontons and bang bang shrimp. My dad and I always get the same thing, house salad and tuna sashimi with extra ginger. Honestly it's the best I've ever had from ANY restaurant. I'm typically the only one that gets a mixed drink and I always try to pick their seasonal drinks. They make an incredible Cold Snap Blackberry Frost that's served in a glass made out of ice. I love going to visit my parents because of our trips to Bonefish Grill and the time that we get to spend together chatting in a relaxing environment. Once we leave it's back to our hectic lives. One of my friend's was having a surprise birthday party at Kobe Italian in Clearwater on a Monday night. Being that it was a Monday we didn't expect it to be very busy. The restaurant was a little hard to find because there is only one sign on the building and it's on a side that isn't very visible in the parking lot. When I walked it the first thing I noticed was I was in a very dark bar area. I was greeted right away and when I told them which party I was with they took me into the back where they had large U shaped tables with a grill table on two sides. In the restaurant area we had plenty of room for the 15 guests and aside from one table finishing up, we were the only ones there. We were offered drinks as soon as half of our guests arrived, which I found to be a little odd. I thought it was standard to be given a water while we wait. Once we were completely seated two waitresses came through to take our appetizer and dinner order. I ordered a ﻿﻿Crunchy Baked Salmon Roll which had baked salmon, smelt roe, asparagus, tempura crunch, avocado and mayo, and I also ordered Jaguar Roll which had Eel, cream cheese and avocado. With my meal I also received a side salad and soup. On Kobe Italian's menu they offered sushi, hibachi and a lot of tempura options. Most of the desserts on the menu sound like they would be brought in or frozen. They offered cheese cake, ice cream and mochi along with a few others. I couldn't find anything on the menu that would represent the Italian food that the restaurant name would lead you to believe. No one from our party had to wait long for their salad to come (for those that ordered it). The soup was right behind the salad and both were delicious. The ginger dressing had a hint of fish sauce flavor and it was light on the spicy ginger. It was pretty good, but different from other restaurants. Unique. The miso soup was hot and delicious. Both of our waitresses were pleasant, but I couldn't help but get the feeling that one of them wasn't happy about having to deal with 15 people. The other seemed pleased as punch to have the business and she was very attentive. My friend sitting next to me no sooner did she put down her empty beer and make a sad face about it and the happier waitress brought another one immediately. That was nice! When they started to bring in everyone's food we were disappointed when some people got their food and were already half way through before the rest of us got our food. When I got my sushi I noticed that they did a great job with plate presentation. Some plates had drawings on it using the sauces and some were just clean and crisp looking. I tried my first bite of the Crunchy Baked Salmon Roll and I tasted a lot of tempura. The flavors were overtaken by the strong salmon flavor and grease from the frier. The Jaguar Roll was really tasty and although the texture was mushy, the flavor was excellent. I shared my roll with my friend and she said the same thing I did about the Salmon Roll. I tried one of her spice tuna rolls and I had trouble keeping it down. It was extremely mushy and didn't taste like spicy tuna, but almost rancid. She kept eating her roll, so she must not have felt the same way I did about it. When I talked to other friend's about their meal they said it was okay, but nothing spectacular. Then again, I'm sure I'm the more opinionated one out of the group... hence the blog. I knew our friend's had brought in our own cake, but I wanted to try the dessert on the menu for the sake of this review. I ordered the only dessert that sounded authentic to the restaurant. 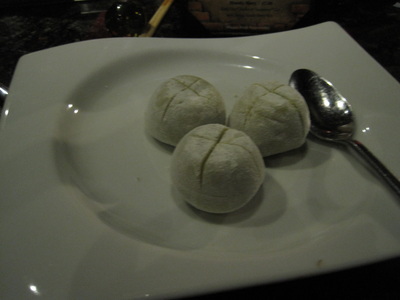 I ordered the green tea mochi which didn't taste much different from the boxed kind you can get at Trader Joe's. Sooo I ended up eating the cake that we brought instead. After the food was taken away and we were waiting on our bills a few of us started to notice a horrible smell. A few people had started to get up and use the restroom which was in the back of the restaurant and when they came back they complained about the sewer smell. I had planned on using the ladies room but my friend told me that I should steer clear of it because the smell would have me running for the hills. I was surprised that we didn't smell it when we came in, but I remembered that another table was in the middle of their hibachi experience when we walked in. At the time the only thing we smelled was the food on the grill table. It's a shame that we had to leave so soon, but none of us could take that smell any longer. Sorry to say, but Kobe Italian is not on my return list. I'm sure everyone has an off night and with 15 people I can see that it might be a difficult party, but we were the only one's there when we started to order. Make your own assumptions here, but in my opinion this Kobe Italian is a "No Doggy Bag For Me" restaurant. Thank god for good company with friends because we still enjoyed ourselves being in each others presence. 9021 Pho didn't make the cut! It's sad to say, but this Pho just made me miss Florida even more. I was hoping that by eating some Pho I'd be reminded of the good times with my friends back at home. I was also excited to introduce my sister to a new dish that she had never tried before. Unfortunately this place that is know for their Pho never lived up to they hype. I should have known that this wasn't going to be a good experience when the place was completely dead at dinner time. It's hard to know how busy places could get or should be when you aren't from the area. I was only visiting my sister in California for a few days and this was only our second time going out at night for a meal. She mentioned how dead it was and that maybe we should look around at the other restaurants in the strip, but I was dying to have her try Pho for the first time. The setting was beautiful. 9021 Pho is located in a shopping complex that happened to be decorated for the holidays. It was laced with Christmas lights and roses throughout the courtyard. They even had an ice rink that was put up just for the holidays. This area is perfect for a dinner and a stroll with a date or with family and friends. 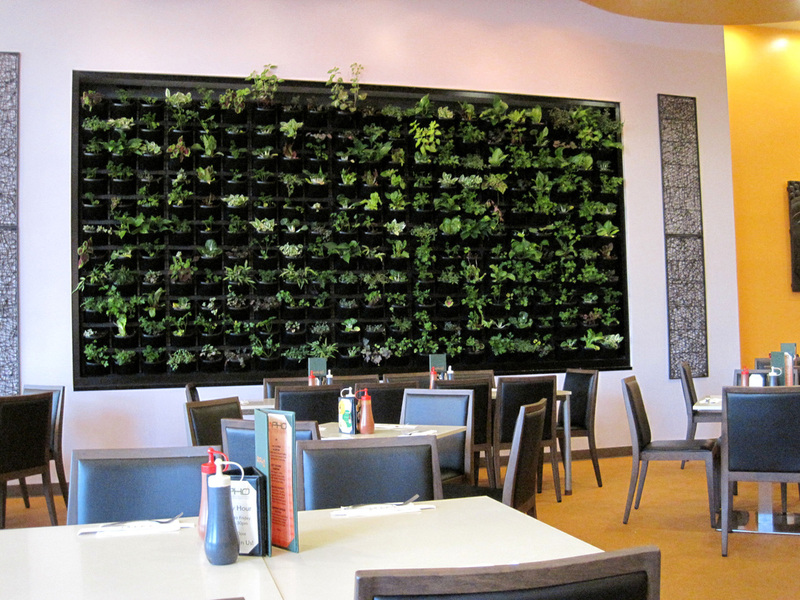 I was surprised that 9021 Pho didn't have any outdoor seating like most of the other restaurants in the area. When we walked inside the first thing that my sister noticed was that it was empty. It was around 7pm on a Wednesday and the only people that were in this restaurant were the servers and cooks. The servers looked clean and well put together being that they were all in black uniforms with their hair pulled back and well groomed in general. The decor was crisp and colorful with clean lines. It was well lit and clean overall. I liked the wall full of plants and the minimalist approach that they implemented and it was nice to see the kitchen was open for the patrons to watch their meals being made. Our server was pleasant and she helped answer all of our questions about the menu. 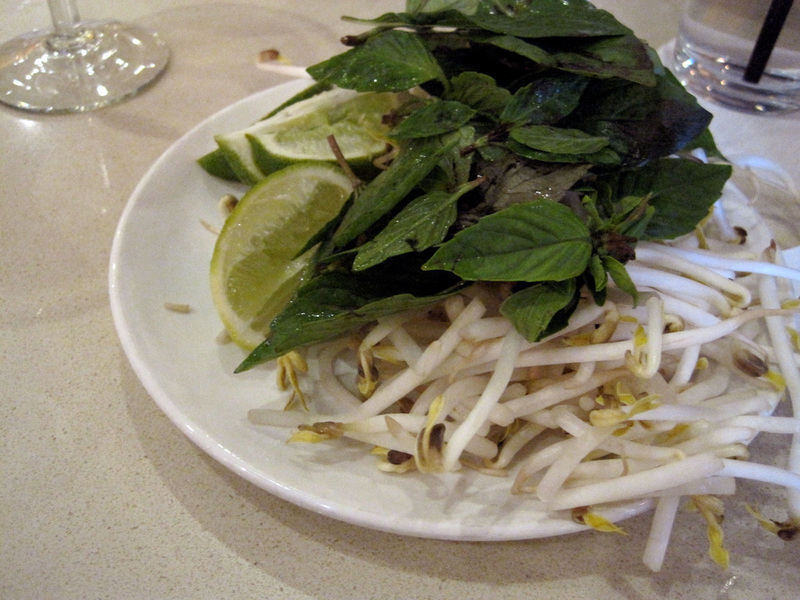 When we ordered our Pho Bo we received our bean sprouts, lime and basil first. The basil was wilted and bruised when it arrived. The Pho Bo only took another 8-10 minutes to arrive. I was pleased with the clean presentation, but one of the first things I noticed was the amount of oil the muddled the broth. Most of the Pho that I've had has always been clean tasting with little to no oil on top. I added my bean sprouts and seasoned my Pho Bo to my liking. My sister followed suit since she didn't know what she should add to her Pho. We both started to grab a spoonful and I noticed that the noodles were in a massive clump all stuck together and braking apart because they were overcooked. It was a shame because there are only a few elements to this soup to begin with and to have the noodles overcooked made it hard to enjoy. The flavor of the broth fell flat and you couldn't recognize any of the spices that give the broth any depth. Just a salty beef flavor. The meatballs in the Pho were tough and almost rubbery. While the meatballs in Pho aren't like a meatball from a spaghetti dish their texture shouldn't be as tough as these were. We did tell the server about the problem and she immediately apologized for the noodles and she asked if we wanted new ones. We decided against the new bowls of Pho because we realized that we had already eaten half of what we were going to be able to eat anyway. Later when we received the bill the server told us that the manager had removed one of our bowls from the bill. I absolutely appreciated the way that they handled themselves and I have to give them great credit for taking care of the situation. While I appreciate how they handled the problem with the bad noodles and mediocre soup it still frustrates me that companies with Pho in their title can't even get their main dish right. I'm sorry for the poor review and I wish I could give them a second chance, but I was only visiting for a couple of days and I didn't want to take the chance on another mediocre meal. The Rabbit Hole - Best Served! Holy Cow! Or should I say, "Holy organic, GMO and preservative free, locally grown deliciousness"!? It was just like taking a trip down the rabbit hole, but it tasted better and I wanted to live there. Forever. I'm sure when you think of rabbits and food together you're thinking lettuce and carrots with maybe a side of bean sprouts, but this place did what Alice did in Wonderland and fell through a magical hole only to be left with wonderment. Let's just paint the picture shall we? 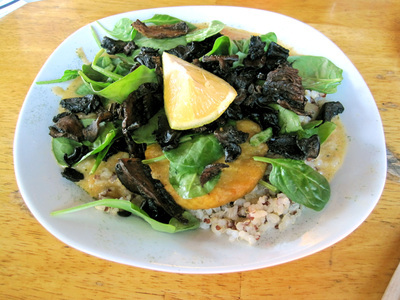 On my visit to California to see my sister she suggested that we go get something healthy at this place called The Rabbit Hole Cafe. After thinking what most people do when they think of rabbits and food (see above) I was more than just a little disappointed. The night before I had a crappy meal and I needed something that was going to be hearty and comforting, like meat and potatoes. Upon pulling up to this place I noticed the outdoor seating in the front of the place. There were just a few tables outside and although The Rabbit Hole Cafe is in a small shopping strip the outdoor seating made the strip feel a little more inviting. When we walked in we had trouble paying attention to seating ourselves because there was a ton of cute little things for sale in the front. They had a little bit of everything from baked goods to jewelry and trinkets. It was an adorable set up and to the right was a sitting area that had a hodge podge of seats and tables. The walls had pictures and murals of characters from the book 'Alice in Wonderland'. Overall, it had a very rustic and warm feeling which helped me get in the spirit of my rabbit food meal that I was about to eat. When we sat down at this very large wooden table and I looked over the menu I knew that this place was going to be good or it was going to fail miserably. Often times when I see things on the menu like vegan cheese sauce, quinoa or sweet potato muffins I'm displeased with the muddled flavors and the overuse of spices. The menu had so many options to choose from. They offered soups and wraps, comfort foods and sandwiches, salads and quinoa bowls and much more. While the menu had so many things to choose from I took a chance on something I would NEVER have ordered anywhere, just to see how crazy this concoction would be. My sister stayed pretty simple and ordered something she had tried before. I ordered the Eggless Benediction Bowl which is described as the following ' Two organic fried chickpea patties topped with our exclusive organic Portobello bacon and fresh organic spinach on bed of brown rice quinoa, smothered in our homemade vegan cheese sauce with lemon.' 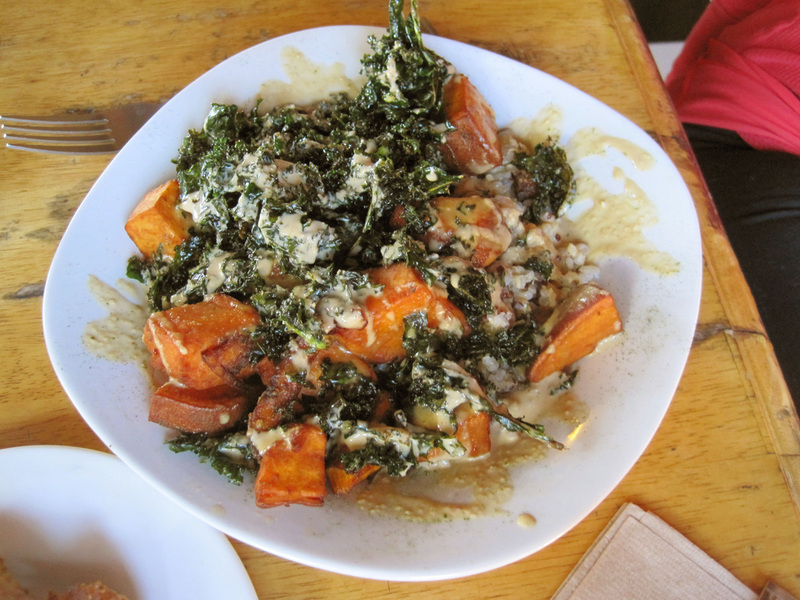 While my sister ordered the Rabbit Hole Bowl which is described as 'A wonderfully yummy and nutritious bowl of quinoa brown rice layered with grilled sweet potatoes and caramelized onions, topped with crispy fried kale and a peanut, ginger lemon dressing'. She also decided to order the sweet potato muffins just to prove a point that starchy sweetness can be transformed into a fluffy muffin without tasting like a rock. We had to go to the front to place our order which was the only drawback to this place. I was finally in a comfortable spot and taking in the ambiance of the decor and aroma from the kitchen and I was bummed when I had to stop being lazy and get up to place my order. Once the order was placed it only took about 10 minutes or so when our plates were delivered to us by two servers. The smell of the sweet potatoes and mushrooms wafted by when they set the bowls down. My sister offered up a bite of hers first before I tried mine. Hers had a sweet and salty flavor that was so delicious that I thought I might want to trade dishes before I had even tasted mine. The quinoa brown rice mixture was cooked to perfection and the sweet potatoes had a crispy outer layer that gave them an almost buttery flavor. The crispy kale was salted just enough to tone down the sweetness of the sweet potatoes and the hint of ginger. It was pumping me up to try my own dish. When I tasted my dish I did so without adding the lemon at first. I found that the chickpeas and vegan cheese sauce took care of that comfort food that I longed for. The spinach was fresh and helped hold my bites of quinoa and portobello mushrooms together. The mixture was incredible and I wouldn't have given it up to anyone. The saltiness of the portobello mushroom chips enhanced the flavor of the vegan cheese sauce while the chickpea patties gave me a flavors of a nutty potato. 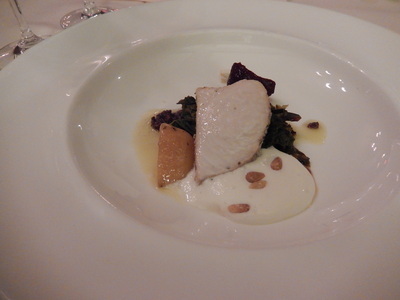 It was amazing how well everything was prepared and crafted in this one dish. Let's just say that I left no rabbit holes unturned when devouring this dish. Ohh and as for the sweet potato muffin, it was fluffy and light and even tastier than I had imagined. I would say that my sister won that argument, but really I feel that we were both winners in this situation. I will however, take my hat off to The Rabbit Hole and their extremely polite staff for changing my mind about what rabbit food could taste like. I always knew that it could taste this good, but I haven't found anyone who could show me how it could be done. This will definitely be a stop on my food travels that will go down in the books as "Best Served"! I love cupcakes and even more I love when a place is KNOWN for their cupcakes. My sister Patti Reilly has been talking about these cupcakes for years. Finally I came out to California to visit her and I was able to try these "amaze balls" cupcakes that she keeps telling me about (her words, not mine). Now for all of you who don't already know this about my reviews, I compare foods that I eat to the best that I've ever eaten. So if I haven't had something that is amazing before the company will have a darn good shot of pleasing me. If I have, well sadly for them, they'll have a lot to live up to. In this case it's a sad but true story. These cupcakes didn't live up to they "amaze ball" hype that my sister so cleverly called them. The place is small and well set up. I love their menu, display and even the smell is delicious when you walk in. I spent a few minutes smelling and viewing the beautiful cupcakes that were in the display and finally I chose a vanilla frosted chocolate cupcake while my sister found a red velvet and double chocolate with her name on it. I wish that I could enjoy a cupcake with a cream cheese frosting base, but I'm not a fan of sweet cream cheese. No cheesecake for me either. Now that I got that hiccup out of the way. We sat down outside the Sprinkles Cupcake location and cup up the cupcakes so I could try both of them. The first thing my sister noticed was that the chocolate one looked dry. She tasted a bite and said that it wasn't as good as normal. When I took a bite I noticed that the cake itself was dry, but the frosting was good. It was very sweet and had the right amount of vanilla flavor, but the cake was so dry that it longed for a glass of milk or even water at this point. When we cut open the red velvet I could see that it was a lot more soft and moist as a cupcake should be. My sister said that it was perfect and she wished that I liked cream cheese frosting. I did try a very small piece of it and I thought the cake was SO MUCH better than the chocolate cupcake. Even the frosting was pretty good on the red velvet cupcake. It was made with cream cheese, but it only had a hint of the cream cheese flavor. Overall I'm going to mark down that I 'liked' Sprinkles Cupcakes, because I can see the potential. I think they might be a great asset to the California dessert industry, but maybe it's because people here haven't had much competition in that department. If you ever want a decadent cupcake you might need to travel to the East Coast. I love food, but who doesn't. Having a good meal in a nice atmosphere with good service makes all the difference in the world when having a meal. Otherwise, wouldn't we all just eat at home? 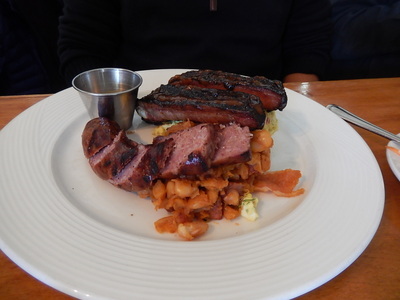 Check out my reviews on local restaurants. Make sure to leave me your take on the restaurants that you've been to!